PESTS CONTROLLED: A wide range of fungal and bacterial diseases including: powdery mildew, rusts, black spot, leaf & fruit spot, downy mildew, fruit rot, late blight, peach leaf curl. USE SITES: hops, herbs, mint, fruits, vegetables, flowers, outdoors and greenhouses. 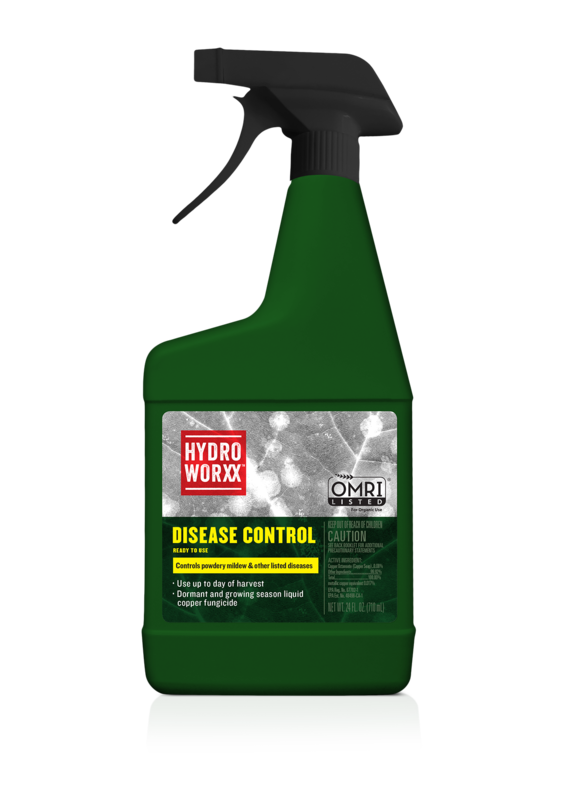 HYDROWORXX DISEASE CONTROL is made by combining a soluble copper with a fatty acid. The copper and the fatty acid combine to form a copper salt of the fatty acid, known technically as a true soap. The copper soap fungicide controls listed diseases using low concentrations of copper. Essential oils have not worked for me in the past to fight diseases on my plants. 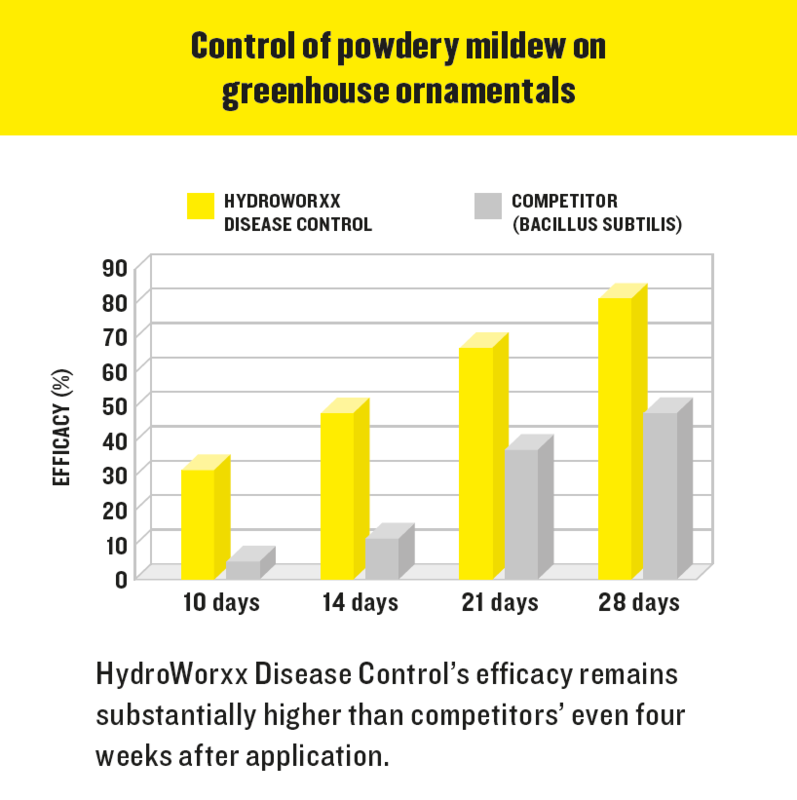 Why does HydroWorxx work so well? Copper is a broad spectrum, contact anti-fungal agent with little risk of fungi developing resistance. It breaks up proteins which disrupts enzyme systems, and prevents the germination of fungal spores. Copper has a long history of use as a fungicide supported by many studies on a wide variety of plants and fungal pests. Looks like this product contains copper. Is it really safe to apply metal on my plants? Fungi and bacteria are quite intolerant to copper but plants require a certain amount of this essential mineral. Copper is a micronutrient and is consumed in small amounts by plants from soil. 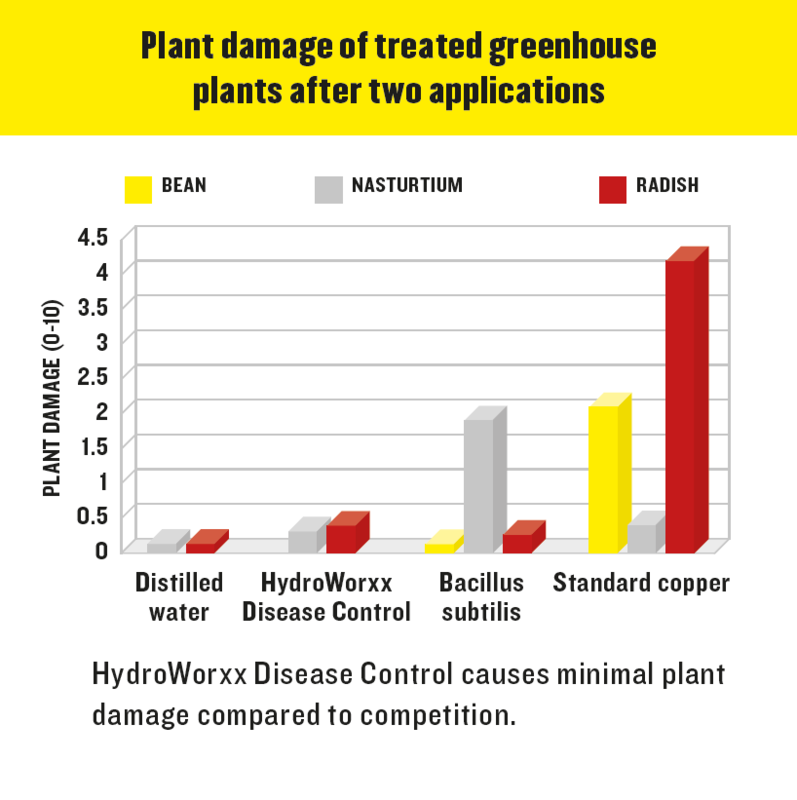 HyroWorxx Disease Control decomposes to form soluble copper, and fatty acid, both of which can be used by microbes and plants. Because the copper in HydroWorxx Disease Control is in the form of a soap, it controls diseases using very low levels of copper. What kind of pests does it work on? This product controls a large variety of diseases and fungi. Here is the complete list: Alternaria blight, Anthracnose leaf and fruit spot, Ascochyta leaf and pod spot, Bacterial blights (halo, common and brown spot), Downy mildew, Gray mold (Botrytis), Powdery mildew, White mold (Sclerotinia), Cercospora leaf spot and blight (earlyblight), White rust, Powdery Mildew, Alternaria leaf blight and brown spot, Septoria (late) blight, Melanose spot, greasy spot, citrus scab, citrus canker, Phytophthora brown rot, Southern corn leaf blight, Stalk rot, Stewart’s wilt, Angular leaf spot, Scab, Ulocladium leaf spot, Phyllosticta, Neck rot (Botrytis), Bacterial soft rot, Bacterial leaf scorch, Cedar Apple Rust, Fireblight, Sooty Blotch, Flyspeck , Quince Rust, Mucor fruit rot, Rhizopus fruit rot Bacterial canker (Pseudomonas syringae), Brown rot, blossom blight, Bacterial leaf spot, Mycosphaerella leaf spot, Phornopsis leaf blight, blackspot, rusts, Rhizoctonia blight, Colletotrichum needle blight, needle blight, dollar spot. Shake container well before use. 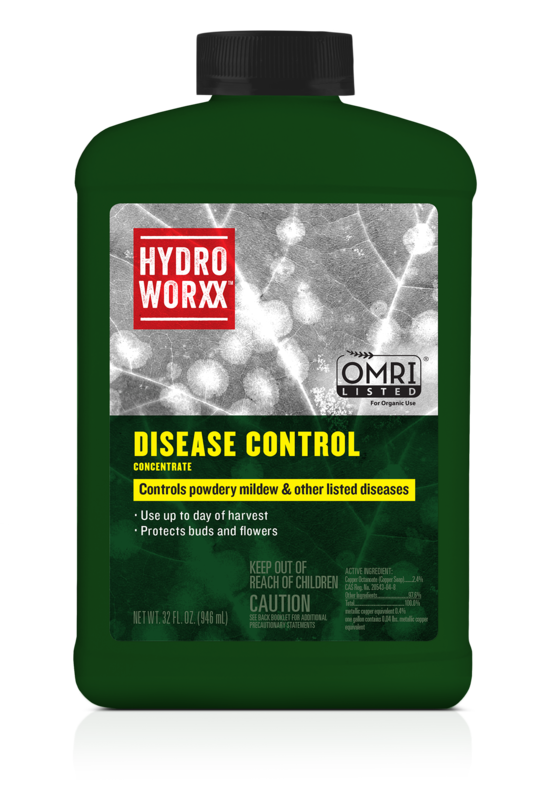 For a regular infestation use HydroWorxx Disease Control Ready to Use spray. Mix 2.6-10.7 fl. oz. of HydroWorxx Disease Control Concentrate in a gallon of water. You may use the lower rate as a preventative spray or for low disease pressure and the higher rate for high disease pressure. Spray all plant parts thoroughly (top and bottom of leaves) just before the point of drip. Apply as soon as disease appears, or as a preventive spray 2 weeks before disease normally appears. If possible, time applications so that at least 12 hours of dry weather follows application. Repeat as needed, following the application directions and reapplication intervals on the label. 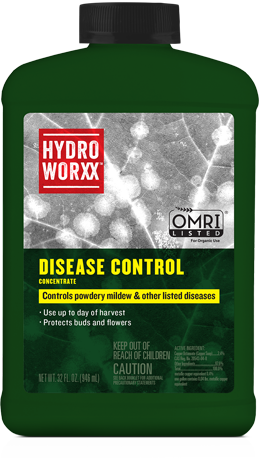 You can use HydroWorxx Disease Control outdoors and in greenhouses.